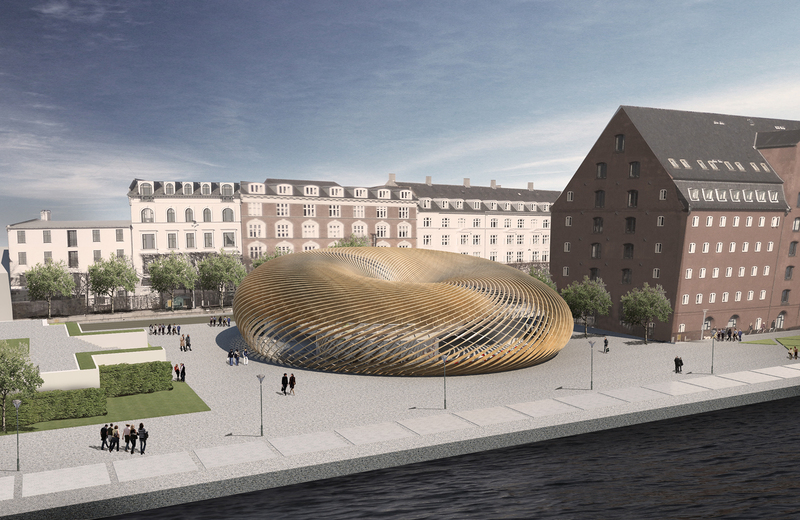 Wine Culture Centre is a recent competition entry designed by Urbanplunger studio. 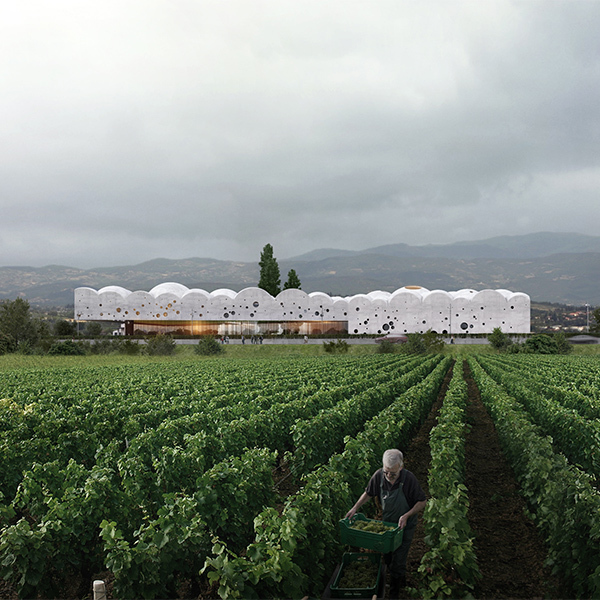 The main purpose of the competition was to rethink the concept of “winery” under a contemporary perspective, transforming the winery from being a simple storehouse / production facility to be a catalyst for culture, tourism and research. The new Wine Culture Centre is a modern building, that fits into the traditional environment through its careful attention to the context. The main feature of the building is a dramatic roofscape that creates new outline on the background of mountains. Many domes compose the spectacular roof surface defining the geometry of the building – in reference to the essence of wine – grape. Such roof shape allows to create impressive interior space and interpretation of traditional Italian arched courtyard. The fruit storehouse that works for 3 month a year only turned into multi-purpose space. In this area you can find number of temporary pneumatic membranes for smaller activities – “learning bubbles” that divides the whole space into different functional zones. Anamorphic Projections and its perspectival techniques offer a way to make a dynamic spatial experience that is three-dimensional and moves further beyond simple geometric projections. More than images that are projected through a space and painted onto surfaces, the physical manifestation of the projection, a cone, allows the user to move away from a two-dimensional realm into one where real forms exist and duality of space is created, the virtual and the real. 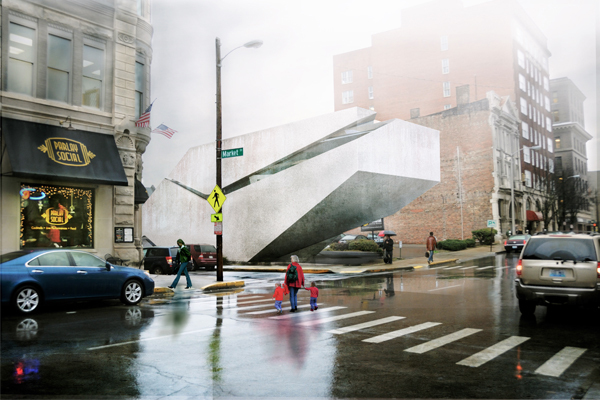 The Lexington Children’s Museum, designed by 1st year graduate student Aaron Fritsch from the University of Kentucky College of Design, is created from within three particular vantage points, referred to as “the aligned views”. The objects and forms within these constructed views are constantly changing due to adjacencies, linear relationships and programmatic demands of the building without ever changing the original view. Where openings are needed for light or double heighted space is desired for programmatic function, the projections are used to carve away the floor or façade. Where openings are needed for entryways or enclosures for privacy, the projections are used cut away walls that are then scaled or extruded relative to the users positioning without obstructing the aligned view. The museum is raised in the front to help generate gathering space that can occur outside and below the building before entering the museum itself. Lifting the building also provides a point of entry and a ramp that is necessary to create an auditorium that is essential to the programmatic demand of the building. As the user reaches the museums entrance, they are confronted with the first view of alignment. As the user moves off of the original vantage point and through the space, the shearing of forms and their linear relationships to one another create new moments of alignment and virtual flatness that the user then comes upon rather than starting with. The overlapping cuts in the floor from the projection allow for an atrium to occur; where circulation can revolve around and a moment of phenomenal transparency can take place vertically through the building. In recent years, China has become the second largest producer and consumer of movies. 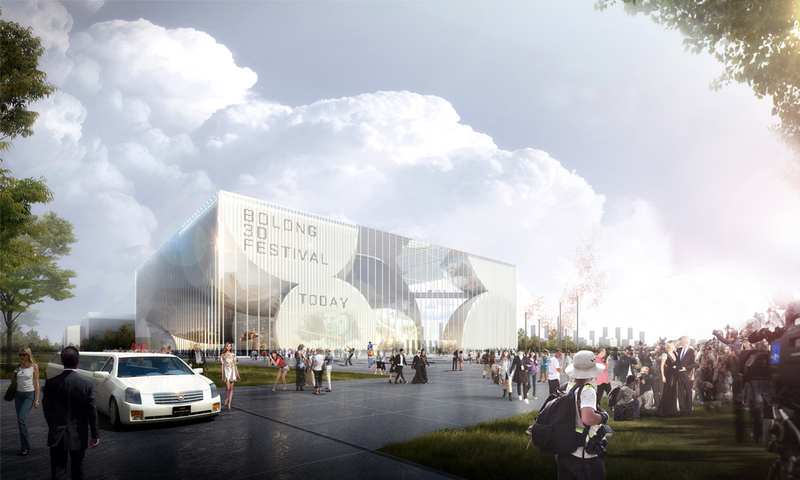 With this as a starting point, the Bolong 3D Movie Museum and Mediatheque is imagined as the cornerstone of a new media park in Tianjin. 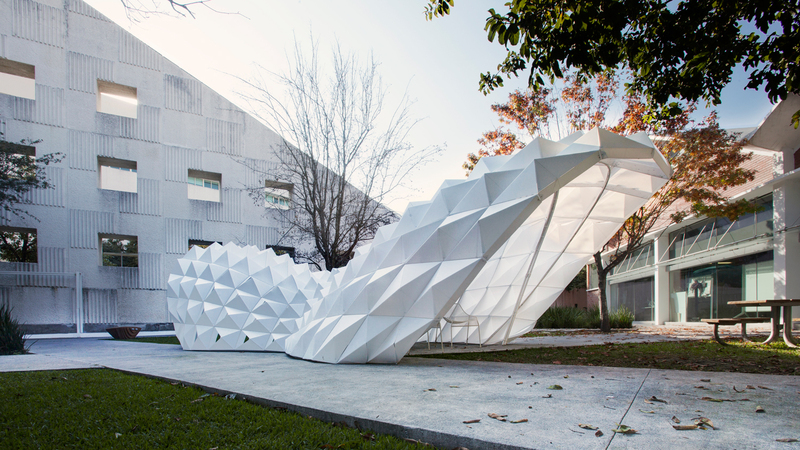 The building design takes it inspiration from the clouds, emphasizing ideas of creativity and inspiration. Each of the buildings programs is encapsulated in its own sphere, creating a series of unique spatial experiences as visitors move through the building. Entering the lobby, visitors are asked to explore the interior universe via series of different public paths, each offering its own unique way of exploring the building. The Parabola Chair designed by Carlo Aiello for ENSSO wins the Red Dot and Good Design awards and launches Kickstarter campaign. The design derived from the mathematical analysis of hyperbolic paraboloids and their strong structural characteristics of minimal surface thickness and long spans. The research focused on the potential of calibrating these surfaces to the human body. Two paraboloids merge into a single surface that serves as seating, backrest, and armrest supported by a lightweight frame. The outcome is a highly sculptural chair seen as an open mesh that allows light and space to flow through – a porous visual statement. 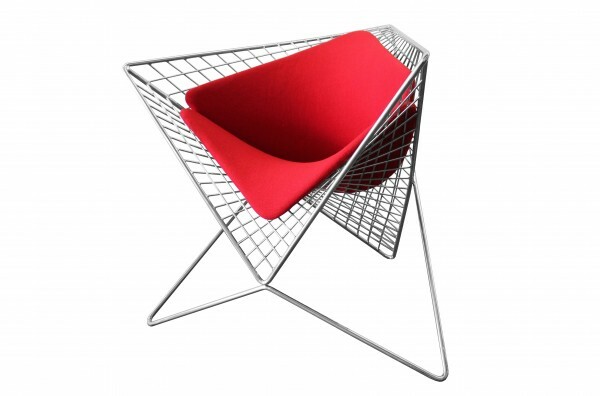 The Parabola Chair is available in polished stainless steel; ideal for indoors and outdoors and it is built to last and delight generations. The form of building reflects the idea of continuous and extended circulation from everywhere to everywhere. Site is surrounded by park, sea, and the city. The new library is center of these three spaces and connect them seamlessly. So the library itself becomes the place for encounter and exchange for people. On the ground floor, public space and entrance hall are located along the path that connects park, sea, and the city. Educational space(lecture room, multimedia room), recreation space(bookstore, cafe), and functional space (elevator core, restroom, office, locker, control room) are seamlessly melting with public path. Like a traditional building typology in Denmark, new library has courtyard, but with more contemporary way. Facade, roof, courtyard and skylight is made of one integrated system. Also this integrated system allows abundant and filtered daylight into the space to make delightful atmosphere.